Once again... Don't use wordpress. 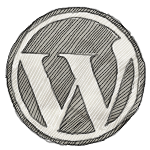 A breach through wordpress made it possible for intruders to spread a compromised version of Linux Mint through the official website. And that's why you shouldn't use wordpress. Check out the comment sections of the link, you'll get the confirmation there. If you download Linux Mint recently, please read the announcement closely.